ESPN, the worldwide leader in sports is a multinational, multimedia sports entertainment company. The company boasts the broadest portfolio of multimedia sports assets with over 50 entities. As the Word Cup fever gripped the world, ESPN wanted to offer excellent coverage through their mobile optimised website across a variety of devices in Singapore, Malaysia, Australia and UK. ESPN wanted to build awareness of the brand new website, promote their global coverage and local relevance whilst gaining customer information. They wanted to find a way to have their target audience link to their website using a printed marketing materials. They needed to create a mailing piece that was cost effective and quick to produce, yet innovative and engaging. 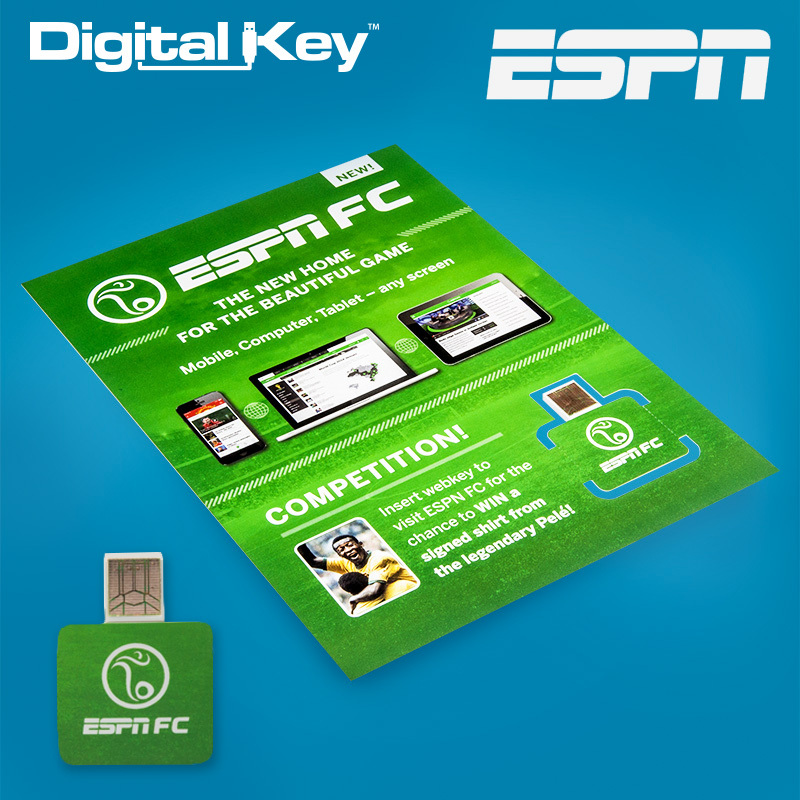 ESPN chose to produce an innovative Digital Key (USB webkey) embedded into print with an attractive promotional competition to help ESPN FC capture vital customer information. Digital Key technology was embedded into a printed flyer and mailed out to contacts in Asia, Australia and the UK. The second time the Digital Key was inserted, the user was greeted with a personalised website message, and, with a simple click, the user was given the option to enter a friend for the completion, view the welcome video again or be redirected to the ESPN website which was filled with live updates and the latest news. As a result of this campaign, multiple personal contact information was captured through the Digital Key cloud based reporting system, which allowed ESPN to create a new list of customers to target and communicate with. The ability to access the website through multiple devices helped to increase website hits. The campaign was a great success as the overall ROI was recorded to be 12%, however reached a greater peak alone in Malaysia at 22%.